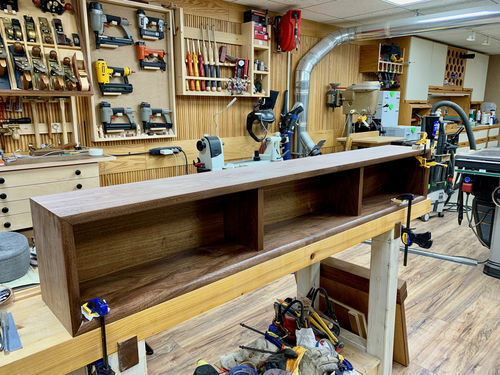 Wall-mounted Console #8: Finishing the finish? I’ve only been at it since late Saturday afternoon, but it seems like weeks. Building a finish with oil? Not sure I’m in love with it and I can understand why guys like using lacquer. Oil finishes do look easy when you see some guy on YT, maybe even an LJ, with a completed piece only needing to shine from the oil finish being applied with a rag. Then magically it’s done and reflecting the rays of the Sun. Not that fast! It takes many, many coats, lots of patience and more specifically, time. Simply rubbing some oil or oil based finish on a lump of wood isn’t all that difficult but to be sure, it takes a lot of time to get to the promise land. Also, sometimes one needs to be a little inventive. Such was the case for me which I’ll explain later. First I had to actually finish a few things before I even got started finishing the finish. I’m using a French cleat to hang this and wanted it to be integral and part of the case and not simply a piece of plywood tacked to the back. So that required a little work. 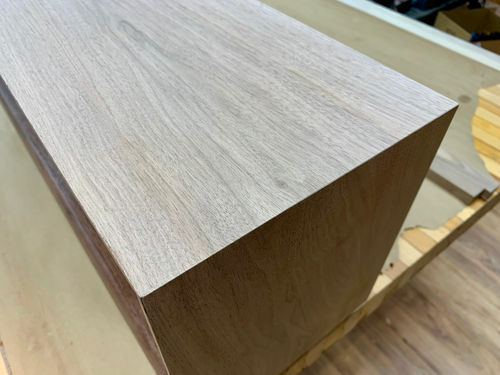 By mortising the back edge of the side components, the support will come from the top edge and the sides, which I feel is a much better solution for this. It will become apparent once the case is glued up and the cleat in place. Then I needed to mortise the locations for the knife hinges. 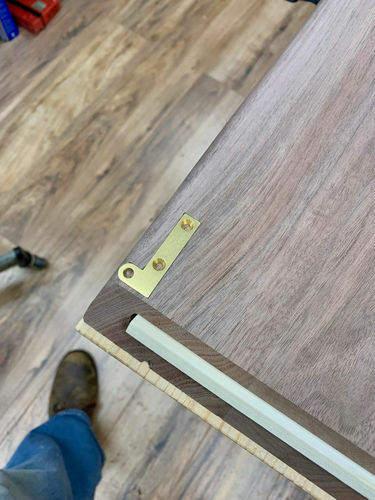 This probably would have been simpler if the front edge wasn’t already profiled, but then I was concerned that routing the front edge would blow out the slim piece remaining on the end. 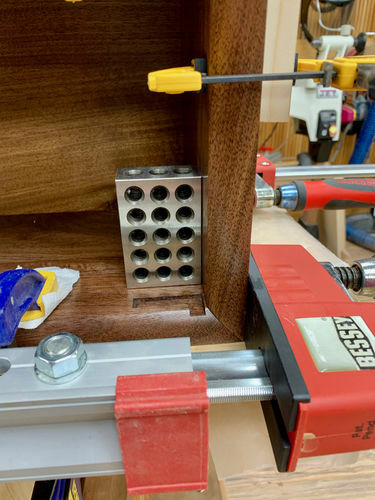 (I actually did just that with the router on a practice piece and realized I needed to feed the router in from the front end to avoid that) So I left this to do afterward. I guess I could have done the mortises by hand, but I was also concerned with my ability to do it uniformly. 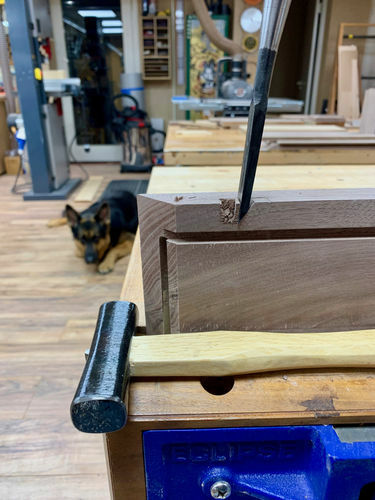 Maybe I was over thinking it, but accurately locating the mortises for knife hinges is key. There’s no adjustability. The template mostly ensures the mortise will land in the same location on all four corners without having to measure. So I made a template and it all seems to have worked, though fitting the doors will tell that story. I also need to fill some voids. They’re on the inside of the cabinet and will never be seen, but I didn’t want to leave them unfilled, especially one knot which I felt could cause problems on the future. So they were filled with West Systems epoxy. The big knot in the top pic kept drinking in the epoxy. I’m glad I took the time to do this. Even though it doesn’t go thru to the other side, I guess a crack could have formed there. Then it was on to sanding. I went thru the grits all the way up to 400, which is what the Maloof finish suggests. 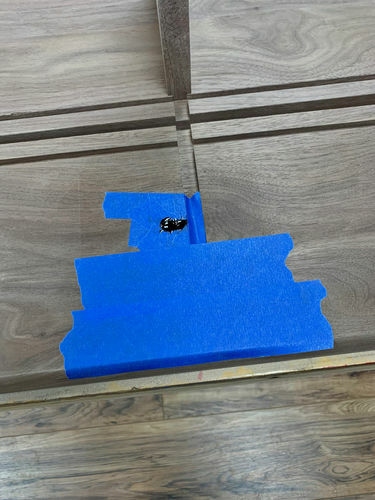 I was concerned here because sanding does change dimensions and that could be an issue with the mitered corners. 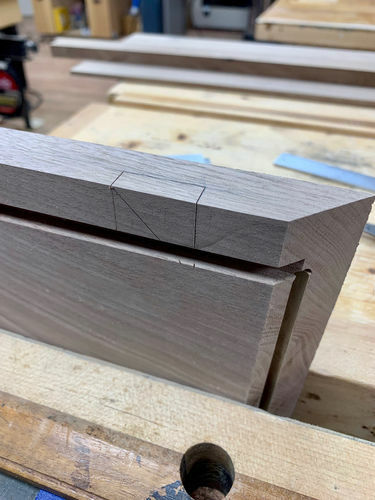 Take too much down on the inside faces and the corners will not meet due to the splines. 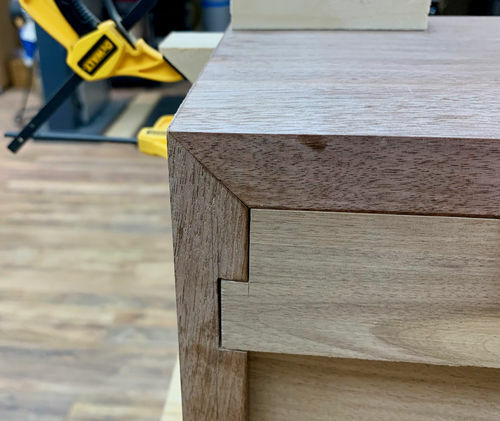 Again, maybe my order of operations needs to be rethought, but having the splines located and in use during the earlier stages of construction helped with fine tuning everything. Then I proceeded with the Maloof oil/poly finish. And proceeded and proceeded some more. The wood just soaked it in and really not much of a build was occurring. What also became apparent was the color variations in the wood. It went from light purple to deep brown. So I applied a few coats, allowed it to cure for 12hrs between coats and not the 24hrs the can says (I would be collecting SS by that time) and sanded with 600 grit between coats. I wet sanded the last coat of the Maloof with the 600 grit paper. Still not looking great and the color variation annoying me, I decided to use Liberon tinted with Dark Walnut Danish oil. This gave things a more even tone and the finish built up more quickly too. I do love the Liberon. It’s expensive, but man it does a really nice job. So at this point, the interior of the case is finished. 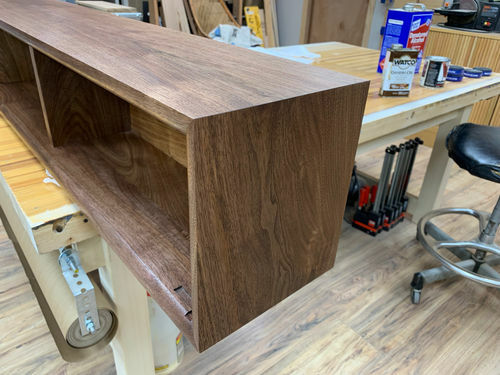 When this last coat is ready, probably tomorrow, I’ll give it a steel wool rubdown with the Maloof oil/wax finish and call it a day on the interior. Then glue it up and get ready to start the process on the outside lol I don’t think I could have done the sanding and finishing if this were assembled. Even though a good portion of the interior is hidden by doors, I obviously want the finish to be the same as that of the outside. It looks good even just laying on the bench. How do you keep the vertical pieces from falling off the cookies? 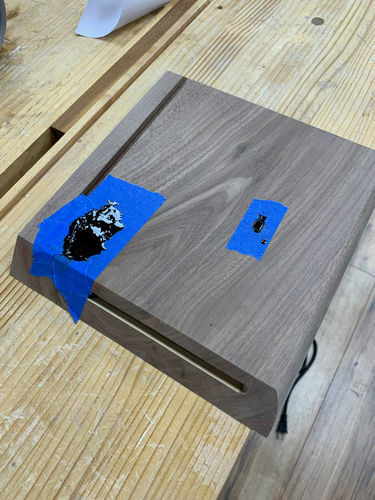 When I have Walnut that has nice color like that, I try to minimize the oil in my finish. It seems like oils even out the gradients which is what I’d prefer to keep. I like the look of what you have going on there though. I’ll have to dig a bit deeper into that finish after I see how this turns out. It’s looking great man! Thanks Kenny. This is how the cleat will engage the case. The back is loose fit to allow for seasonal movement. It’s also 1/4” thick so it’s not anything to mount thru. The cleat will be glued along its length on the top edge and at the mortise, becoming an integral part of the case. 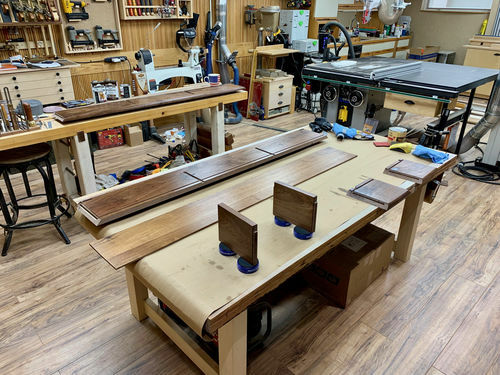 I wanted to do a dry run on the glue-up. 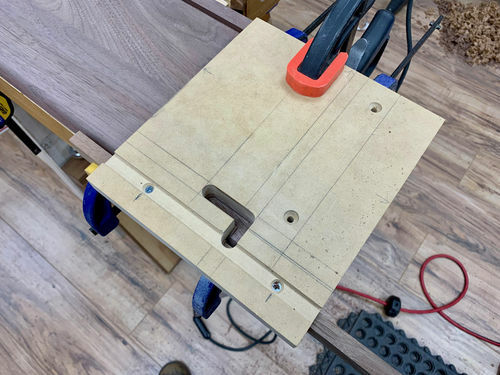 So first I made some corner clamping blocks on the bandsaw. Each has a strip of 320 self-stick sandpaper on the bottom face. Four sets should cover me. 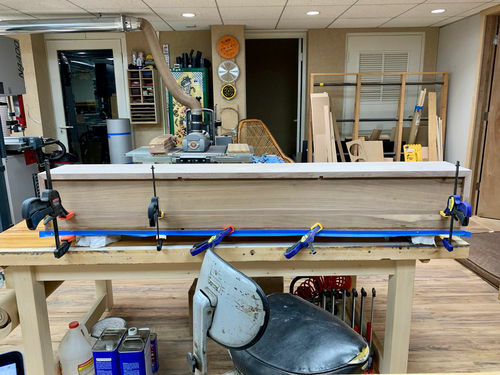 With the bottom resting on the bench surface, the case only needs to be clamped along its length. I’ll use the corner clamping blocks for the top panel. Tomorrow I’ll rub out the finish on the inside, glue this up and then start on the outside. 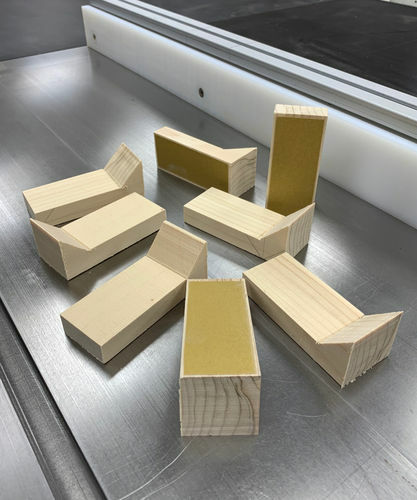 Hmmm…guess I now have a solid reason to get a bandsaw – I want to make those corner clamping blocks!! 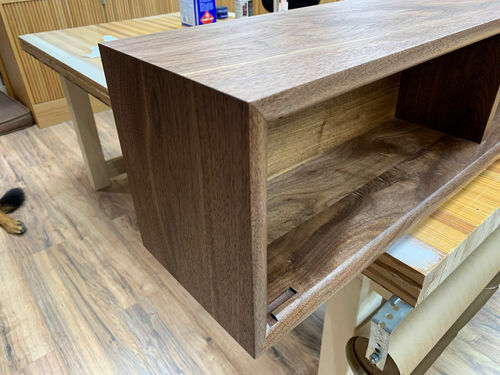 I’m a big fan of walnut and this looks just great. Got lost a bit in the discussion of finishes. That’s definitely an aspect I have a lot to learn. Nice Bill! The whole cleat idea seems like serious overkill. It’s perfect! 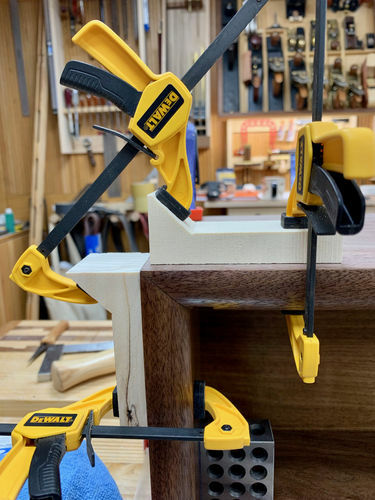 Well Barbara you can certainly use that as an excuse to buy a bandsaw, but you can also cut them with a hand saw ;) I still have a lot to learn about finishes too. Thanks Kenny. Being an engineer I’m sure you can identify with overkill – belt and suspenders. So between doing regular life stuff, I’ve been working at completing this for the foyer. 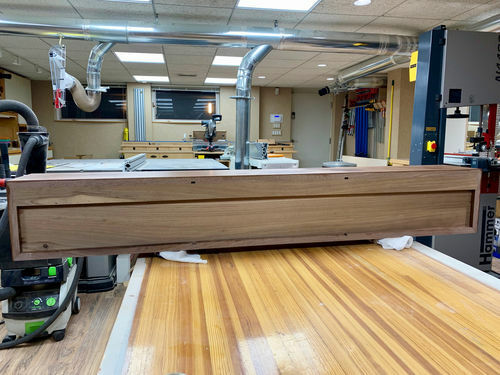 After completing the finish on the interior sides and allowing them to cure a bit longer, I did the glue-up. Anxious times lol It actually went pretty smoothly. 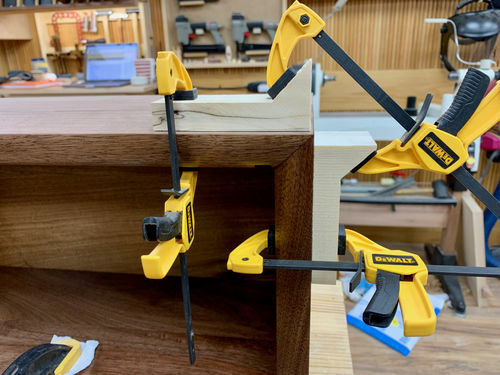 The little corner clamping blocks really worked out doing what they were intended to do. After the assembly had dried, I installed the cleat at the rear of the case. Then it was time for sanding the outer sides of the case. This time I went thru the grits to 600. And now it has the first few coats of the Maloof poly/oil. A few more coats and it’s time to finish the doors. 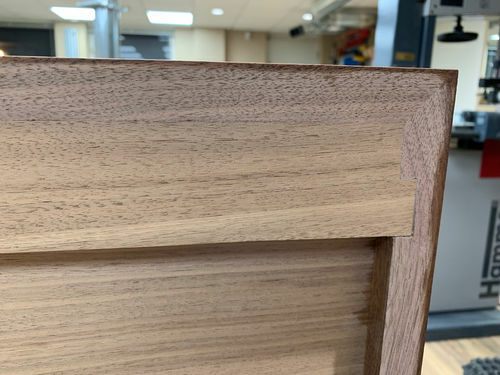 Regarding the doors which are zebra wood, I picked up some Rubio Monocoat and man does it look great on the sample I made up. My initial thoughts were to use either a water based poly or lacquer. I’m going to make up a sample of each, but I have to say, nothing could be easier to apply than the Monocoat. Squeegee it on and wipe it down. It leaves a satiny smooth finish that is said to be very durable. If more of a sheen is desired, I think it can be polished further. I’m actually considering redoing some flooring in the house, which is Brazilian cherry, with the Monocoat. No brushing with lambs wool, no odor, well it has a somewhat sweet odor, but basically it’s lay it down with a buffer and polish it down with a clean pad. No brush marks or fisheyes to worry about. And the stuff comes in colors. Probably a late Spring project when the windows can remain open. Looked up that monocoat finish and looks very interesting. I use a lot of GF water-based products as I am doing most of my finish application in our living room so the smell with oil based is a deal breaker. By the way, your console is looking great. 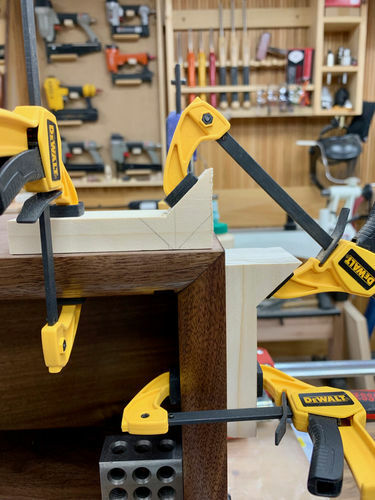 Glad the corner clamps are working out. 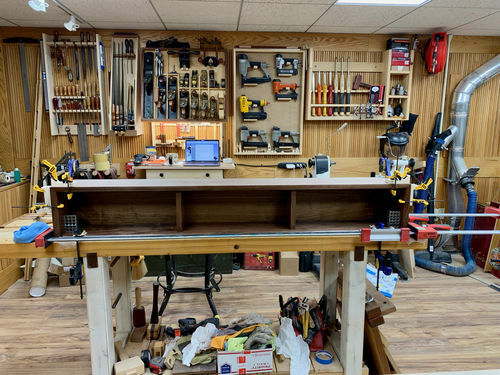 Anything that takes some of the stress out of glue-up time! The Monocoat is an oil base product, but the odor isn’t strong and it’s somewhat sweet smelling. The Maloof oil is similar in odor. However most water based finishes I’ve used have very little odor and less that the other two. The reason I’m considering water based finish for the doors is the clarity. They don’t impart much if any color. Same would apply to lacquer, but that is pretty powerful smelling stuff. Respirator material. It’s looking good, Bill! I’m interested to hear more about the monocoat once you know more. Thanks Dave. Can’t tell you much more other than what’s already on the net about it. It’s really easy to apply. Nothing to level like a film finish needs to do, so no worry about drips or other poor application issues. And it doesn’t soak into the wood like a normal oil finish would. The claim is it “binds with the fibers of the wood”. The other claims are nothing sticks to it and it doesn’t stick to itself, so only one application is needed and/or can be done. It’s two parts -A&B. One is the oil and the other an activator or catalyst. Not in the shop now, but from memory it’s a 3 to 1 part A to part B ratio mix. I’m going to see what kind of sheen I can achieve with a buffing wheel and some compound. The sheen it achieved out of the can looks fine on the zebra wood for what I want, but maybe there’s more possibilities. I’ll post a pic of the raw wood sanded and then with the finish when I go down to the shop.